The 2017 Southbourne Christmas Quickplay Handicap Chess Tournament had its best turnout for over 10 years with 29 entries. Grzegorz Sawicki was the sole leader from an early stage and the one to chase. 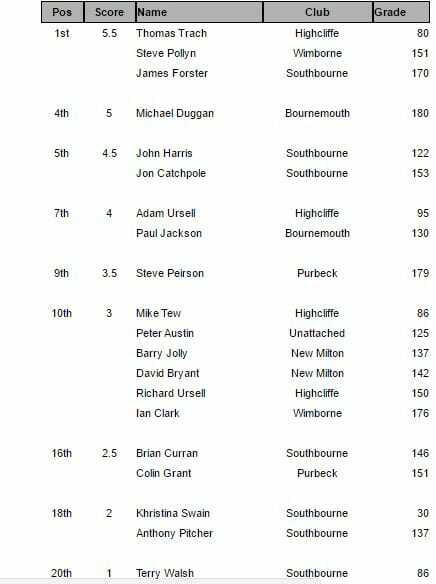 After establishing a one point lead he was eventually caught by Bruce Jenks in the last round after Bruce managed to beat him so the two Southbourne players deservedly came equal first. It was a very successful evening with a good two thirds of the players being represented by players from other clubs and with 45 prizes there were more wrapped up gifts than players! Bucks fizz, tea and mince pies were enjoyed by all and, as with past Christmas tournaments, everyone went home with a welcome gift. A great end to 2017! On a very wet and windy Friday evening, 20 players braved the weather conditions to participate in this enjoyable annual event where, as always, there were free mince pies, yule log, bucks fizz, tea, coffee, biscuits, not to mention the awful Christmas music (to put players off) and there were also enough wrapped up prizes for everyone to win at least two each! There was also an opportunity to buy a chess book or two. The tournament was in the form of a 7 round swiss with 20 minutes allocated to each game. That's the easy bit! The hard bit was that those annoyingly higher graded players were time handicapped and often had to play with far less time than their lower graded opponents. In some cases this resulted in them only having 1.5 minutes to their opponent's 18.5 minutes! Matches were hard fought and often kings were taken when sneaky checks went unnoticed! After 4 rounds, the two heavyweights, in grading terms, Michael Duggan and Steve Peirson were looking firm favourites, jointly leading with a score of 3.5pts, but they did not take account of the poison they were given during the break. So who did spike their drinks? Was Father Christmas being mischievous? During the last 3 rounds, with apologies to Steve Pollyn, youth prevailed. Maybe these players had more stamina. Congratulations therefore go to Thomas Trach, James Forster and Steve Pollyn who came equal 1st on 5.5pts out of 7 and who all walked away with 4 Christmas presents each. The full result is given below and and it was pleasing that so many local clubs were represented. Mike Jay has kindly offered to publish the results on the Dorset Chess website. My thanks must go to Brian Curran who kindly donated many of the more expensive presents but thanks also go to everyone else who donated prizes and food to the tournament to make it a very enjoyable evening. I hope you all have a great Christmas and good chess games in 2017.